Typhoid fever is caused by Salmonella typhi which is a gram negative rod bacteria.Human being is the main resevoir for Salmonella typhi. Blood culture is useful in identifying the present of Salmonella typhi. Salmonella typhi may lead to typhoid fever. Typhoid fever may present with fever ( more than 3 weeks), crampy abdominal pain, diarrhea ( gastrointestinal symptoms ) which later progress into systemic illness. Salmonella typhi infection may be spread following ingestion of water or food that is contaminated. It is important to prevent the spread of Salmonella typhi by promoting proper sanitation, hand wash and food preparation. Salmonella typhi may be shed in stool for years and the patient infected with Salmonella typhi may become the chronic carrier ( Salmonella typhi may colonized the gallbladder). Salmonella typhi carries its own virulence mechanism which includes endotoxin and Vi polysaccharides capsules ( there are vaccines against Vi polysaccharides). 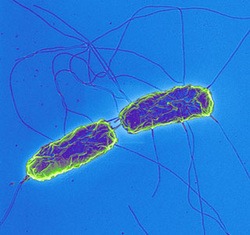 Salmonella typhi will invade the M cells of the intestines. This will follow later with replication of Salmonella typhi in the endosomes ( endotoxin will be released following replication at the liver or spleen) which further lead to migration to the subepithelial layer.At the subepithelial layer, the Salmonella typhi will be engulfed by macrophages. The Salmonella typhi will later enter the blood system and lymphatic system. There are few antibiotics which appear to be useful in treating typhoid fever such as chloramphenicol, ampicillin, ceftriaxone, trimethoprim and ciprofloxacin. 1.Hornick, R_B, et al. "Typhoid fever: pathogenesis and immunologic control. "The New England journal of medicine 283.13 (1970): 686. 2.Kidgell, Claire, et al. "< i> Salmonella typhi</i>, the causative agent of typhoid fever, is approximately 50,000 years old." Infection, Genetics and Evolution 2.1 (2002): 39-45.